A bumble bee on wild senna. 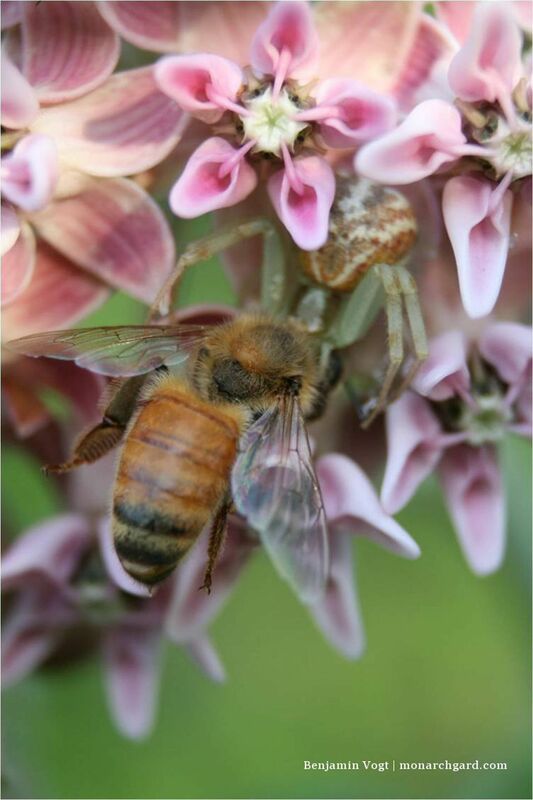 Honey bee caught by a spider on milkweed. About 25 percent of native bees live in cavities or stems. Leave stems 1-2 feet high in spring when you cut back plants. There’s nothing like being in a beautiful garden – sitting among stunning colors that call our eye toward new vistas, breathing in the aromas of delicate flowers, admiring the textures of various leaves or noticing how quickly blooms have turned to tasty berries. Oh, the calmness and joy of a lush garden alive and vibrant with sound and color! And what happens when a bird dives through trees or splashes in a fountain? It’s like a gift. And what about a swallowtail or monarch butterfly that dances like a hot potato from bloom to bloom? Nothing short of a blessing. What our gardens give to us emotionally, they give to life physically – a garden is more and more nothing short of a wildlife refuge as wild places vanish. It’s estimated that 70 percent of U.S. grasslands and prairies will be gone by 2100, and kids growing up today see 35 percent fewer butterflies and bees than their parents did 40 years ago. From birds to butterflies, to moths, flies, beetles, wasps and spiders, our gardens are a gathering point for nature, sometimes a literal lifeline. That’s true for bees, which are much in the news, but too often when we hear the word “bee” we think only of European honey bees. It takes 60 percent of all U.S. honey bee hives to pollinate just the almond crop in California, and the stress of shipping them cross country surely exacerbates their troubles, as well as the lack of diverse flower forage for a balanced diet. Yes, helping honey bees will help so much more, especially if this means fewer lawns and more prairies, but we have 4,000 native bee species, too. These native bees are, collectively, over 90 percent efficient at flower pollination, whereas honey bees are only 70 percent efficient. Many native bees have evolved very specific relationships with native plants – in some cases, the absence of one leads to the absence of the other. The more bees of all species we have pollinating, the higher the fruit yield, the better the quality, and the longer the shelf life at grocery stores (produce like strawberries require a diversity of pollinators to set fruit, while squash and tomatoes must have native bees). The Xerces Society has recently started a pilot program on about 100 acres of almond groves in California, planting the edges with native hedgerows and underplanting the trees in a meadow. The goal is to end dependence on overworked honey bees, reduce water consumption and mitigate the need to spray for pests by inviting beneficial insect predators. We should also look to the Prairie STRIPS program at the Leopold Center for Sustainable Agriculture. By literally using strips of prairie in row crop fields, topsoil loss and nutrient runoff is cut by around 90 percent, leading to cleaner water, more stable farmland and healthier pollinator populations. Here in Nebraska, and Lincoln specifically, I’d love to see us become the prairie capital of the nation: with prairie along road edges following the lead of New Mexico and Iowa, native plants in our garden beds and in the new pedestrian mall downtown, and one side of the state building in prairie gardens vs. a desert of high-maintenance lawn. Our lives, and the lives of other species, may depend upon a new landscape aesthetic that incorporates both human concepts of beauty and unseen ecological function that supports native bees, monarch butterflies and far more. What we need is a beauty that extends to species beyond our own. What do bees find pretty? Many insects need native plants to survive – plants they co-evolved with. There are native bee species that forage only on specific plants while in bloom, let’s say an aster that flowers for just a week or two in the fall. A native bee times its emergence for when that aster blooms, then gathers pollen, which it places in a cell with an egg – either in the ground or in a tree cavity or hollow plant stem. The egg overwinters, turns into a larva, then emerges as an adult bee the following autumn to forage on the aster and start the cycle all over again. Luckily, nearly all of our native bees are solitary insects – they have no hive to defend so are hardly aggressive. Only females have stingers, and a large majority of those “stingers” are actually only egg-laying ovipositors with no venom. Native bees are far less likely to come after us. In fact, on a cool spring morning or fall evening, you might see a bumblebee on the ground; it’s cold and can’t move. Pick it up, place it on your palm, and soon enough it will warm up and fly away. As you celebrate the garden, remember to celebrate all the life it supports. This fall – the best time to plant with cooler temps and increased rainfall – think about how the garden can appeal to us and to wildlife at the same time. And leave the winter garden standing since many native bees are sleeping out there, in the leaf litter or in plant stems. In spring, cut plant stems 1-2 feet high instead of at ground level – they make excellent native bee hotels which, when you get on your knees, you can hear buzzing with life. Oh, what a wonderful world the garden creates for all of us to enjoy! Benjamin Vogt owns Monarch Gardens, a prairie garden consulting and design firm. He writes a weekly column at Houzz.com and digs in Lincoln with over 2,500 square feet of plants.